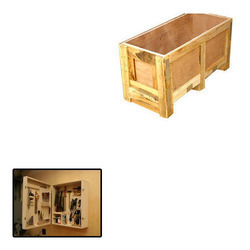 Our range of products include plywood boxes for cabinets. With a precise understanding of the relevant industry, we introduce ourselves as the leading manufacturer, wholesaler and supplier of Plywood Boxes for Cabinets. The offered boxes are crafted by using advanced technology and optimum quality plywood by our skilled professionals in line with the industry norms. Used for wooden packaging and storage, our quality experts test these boxes against varied quality parameters. Clients can avail these boxes from us at nominal prices. Looking for Plywood Boxes for Cabinets ?